I don't understand why this is such a big deal. Many countries around the world have a hard border with a physical barrier in place to stop illegal crossing/smuggling. It doesn't seem inherently unreasonable that the US has one as well, especially given the border with Mexico is well known for illegal crossing and drug smuggling. Why is this seemingly normal function of government seen as such a contentious issue that it's worth shutting down the government for, and what do the Democrats have to gain politically from the continued illegal activity on the border? Surely Democrats are equally affected by the criminal behaviour as well(?). They could make a deal and get something that would make a real material difference to the electorate, and I don't see why they're going to the mat for this. The border wall is polarizing because Donald Trump wants it, and Donald Trump is a polarizing figure. This is a cynical answer, but I think it’s actually more accurate than the other answers, which attempt to discuss the relative merit of the border wall as a policy. The thing is, the merit of a border wall as a policy has been whatever it has been for many years, but widespread opposition to the border wall has only started since Donald Trump started talking about it. tl;dr: The wall is only an idea with lots of blanks. People on different sides of the divide fill in the blanks differently, so they end up with different conclusions. There is still nothing more to The Wall than the idea. A concrete project to build the wall, a plan for how it would look, an estimate what it would cost, or even a clear objective that it would achieve, is not part of the discussion. Such a plan to have a discussion about simply doesn't exist. And it gets worse. Nobody has yet clearly and fully defined the problem The Wall is supposed to solve. Right now, any attempt to dive into the facts of The Wall discussion will fail before it starts, because none of the involved politicians can enumerate the actual real life problems The Wall is supposed to solve, let alone explain how The Wall does so better than alternative options. OP's words are true, but the 3 implied statements are not. * While there are untrue or unproven implicit statements in circulation on both sides, I chose the claims implied by OP because of simplicity, and because they are particularly popular falsehoods. The divide over the idea of the wall is magnified due to the unfortunate fact that in the US there is a very peculiar situation where one of the major news networks specializes in the intentional spread of such false and misleading information through implied statements. All in all, a wall is a simple solution that doesn't address a complex problem, except in the minds of some of the voters. And both sides - one much more so than the other - play around the issue by avoiding any actually relevant hard facts and data, to avoid being called out by the other side. *Disclaimer: The below shows, on request, the 3 implied falsehoods are such. It is not strictly relevant to, or part of, this answer, but it will satisfy some people's curiosity. Some people in comments assumed that the below is the answer. It isn't. 1) Only a tiny fraction of worldwide borders have walls, while the overwhelming majority or borders do not have man made barriers. You'll also notice that among the small fraction of borders that sport man made barriers, a majority seem to be borders between hostile nations such as India-Pakistan, Ukraine-Russia, and Korea-Korea. 2) Drugs already cross the US-Mexican border in places where man-made barriers exist, over, under and through the barriers. Smugglers use plenty of routes and methods that will be entirely unaffected by any new wall (catapults, smuggling through ports of entry, planes/drones, tunnels). 3) Visa overstays are completely unaffected by a physical barrier of any kind. Immigrants who want to surrender themselves to request asylum don't even need to get to the other side of the wall, they just need to find a border patrol on US soil. The remaining immigrants already need tools/vehicles and often hire experienced guides to cross the border - requiring guides to spend money on a set of very cheap and lightweight tools (ladders, ropes, blankets) is unlikely to deter them. In addition to the above, the symbolism of the Wall plays strongly into a pre-existing political divide, as outlined in Michael Kay's answer. You don't shut down the government over a disagreement about the cost benefit analysis of something that costs 5 billion dollars. There is obviously some deeply political/philosophical objection to the wall. I think your comment is to the point. There is a philosophical objection. Mainly, the current administration has planned to put millions off of health care yet they plan to spend billions (5.7B$ now, but how long until more is needed?) on a wall. Now look at that from the Democrats perspective. They can let it happen and be seen as enabling Trump. On the other hand, as they do now, they can take a stand. Obviously, taking a stand is not without disadvantages: the shutdown has many disadvantages for the public, especially public servants. Either Trump gives in and the Democrats have a moral victory or the shutdown carries on and the pressure (on everyone) grows. Eventually, someone will give in (or new elections happen) and the electorate will choose a side. It's a polarising issue because it symbolises hostility towards foreigners, which is intrinsically an emotive subject. If you actually want to reduce illegal immigration in the most cost-effective way possible, then other methods (e.g. more careful vetting at ports and airports) probably work better; but the wall sends a visible message "not wanted here". It thus draws out a division between people who think foreigners should be treated with as much respect and dignity as possible, and those who regard them as an intrinsic threat to the American nation. Europe has also been building physical barriers against would-be migrants. This hasn't attracted the same level of controversy, mainly because the democratic process in Europe works rather differently. The problem with this wall proposal is that we already have a wall. It was built in the 1990s under President Clinton, and expanded under every President since. And the existing wall looks every bit like the Berlin/East Germany wall in sections, complete with double fencing and dog runs. Had then-candidate Trump proposed expanding this wall, it probably would have been uncontroversial. It also would have been much cheaper, but given his personality and his previous remark about "rapists. And a few good people" admitting that we already have a wall wouldn't have been very successful as a campaign promise. As an aside, Clinton's wall actually backfired. Before the wall was built, Mexican workers usually tended to come only for a few weeks for harvest season, and then return home. The wall made the trip much more expensive and difficult. The hope was that this would deter Mexicans (and people from points further south) from crossing into the US. Instead, it deterred them from leaving after harvest season. What used to be undocument non-immigrant workers became year-round undocumented immigrants, who then started bringing wives and children. That fact is not very well known, though, so it's not likely a factor in why Trump's wall proposal is so polarizing. Tunnels can go under walls. Most illegal immigrants and drugs come into the country through other means. Much of the opposition to the wall is due to the belief that it will be costly and ineffective while creating problems. They disagree that it will be a "real material difference to the electorate", at least in the implied positive way you put it. In a nutshell they don't agree with wasting money on something they see at best as being mostly pointless and at worst highly problematic. I'm not trying to go full PoMo here, but meaning is often socially constructed. Anything can be politically polarizing if a critical mass of people perceive it to be that way. We could be talking about a waist-high barrier in someone's back yard if such a thing came to national attention and had some sort of symbolic weight. Think about some issues that are political issues (at least in the US) that shouldn't be: climate change, voter fraud, etc. But as I've said elsewhere on this site, these things aren't just subjects for discussion but membership cards, marking people as one of us/those people we hate. We cannot have real conversations anymore about these topics. They have been hijacked to denote tribal affiliation. Attempting to make any sort of argument on the object-level question will end in disaster. Indeed, based on the comments and downvotes, merely citing an example pointing this out has been a disaster. Other Person: "I don't see why anyone would doubt the scientific consensus on climate change"
Me: "Are you a climate scientist? Hang out with any? Read any peer-reviewed literature on the topic over the last 20 years? Even just the abstract of a single paper from the last 20 years? How do you know what the scientific consensus is?" Other Person: "You're obviously one of those science-denying Fox-watching troglodytes." Now certainly, some people do in fact understand that such really is the scientific consensus. But, and this is germane to my point, most people won't even do a single google-search's level of due diligence. The real problem is that I'm addressing the statement at the object level. What the other person is actually saying is "I'm a card-carrying member of the Republican-haters club" and when I say what I say they translate it to "I'm a Republican, come at me bro". The problem is this is an especially crappy thing to treat this way: the future of the planet may well depend on having the correct policies around this issue. But we can't have a frank conversation about it anymore. 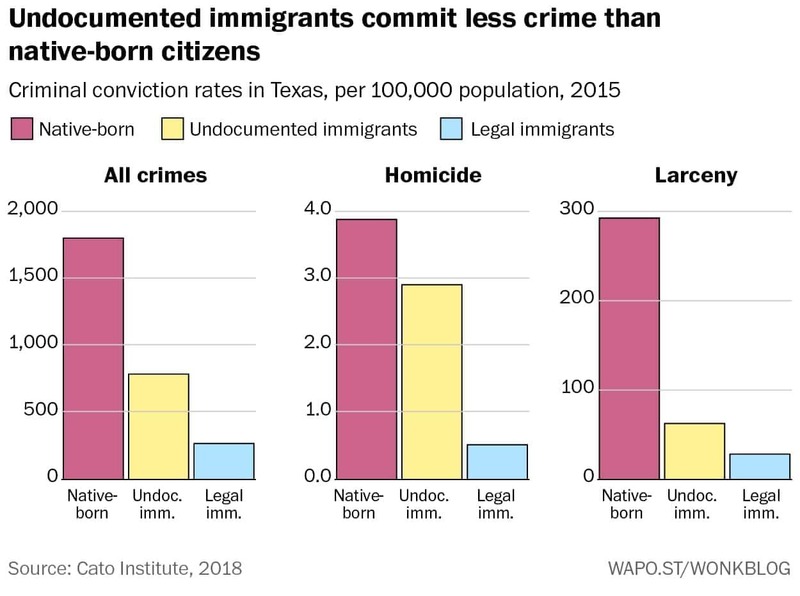 Illegal immigration is in the same boat (albeit not as critical to the fate of the planet), and the wall is just the rallying point for opposing forces. It could have been anything. I'd have preferred they picked something that didn't cost $5 billion, but that's another topic. The short answer is that some private citizens and elected officials think a border wall will substantially contribute to the policy objective of acting as a deterrent to illegal immigration and drug smuggling and is a sound proposed investment in U.S. national security; and other private citizens and elected officials think that a border wall will not substantially contribute to the policy objective of acting a deterrent to illegal immigration and drug smuggling and is not a sound proposed investment in U.S. national security. The issue might presently appear to some to be particularly polarizing because it is a case of first impression and is a live controversy directly involving or affecting several nations and millions of people that has not been settled. The wall itself (whether effective or otherwise) is a symbol for the entire debate concerning how open America should be to immigration. One of the reasons for this debate is that it is very difficult for people to enter the United States legally. If you are the child (over 21 years of age) of a US citizen, you are in the first preference. The wait for a US visa in this category can be six years. If you are the child or spouse of a green card holder, you are in the second preference. The wait for a US visa in this category can be five to ten years. If you are the married child of a US citizen, you are in third preference. The wait for a US visa in this category can be eight years. If you are the sibling of a US citizen, you are in fourth preference. Several things can affect waiting times of family-sponsored green card applications. 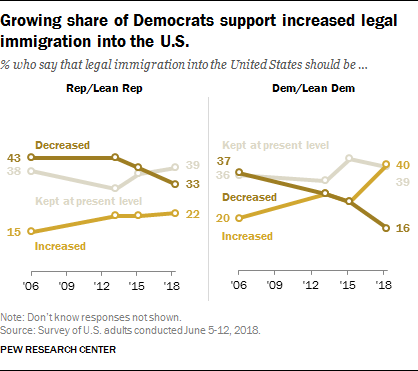 People who think we should be more open to immigration see this and oppose steps to enforce our immigration laws because they see our immigration system's rejection of people who want to contribute to our country's success as both immoral and counterproductive, as well as a general failure for our government to enact laws to open up our immigration system more generally (indeed, evidence points towards actions that go in the exact opposite direction). They also see it as against our basic cultural values, against a potential source of economic prosperity, and against the source of some of our most impactful successes. This motivates a lot of the "sanctuary" legislation and more general opposition to the wall. The problem is Trump himself. He reneges on deals, sometimes even before the "other side" has left the room. Before you can possibly make any sort of deal, both sides need to have some credibility that the other would uphold their side of a bargain. To date, Trump, as President, has not shown that he is willing to back his words and tweets with any reliability. surely ... are equally affected by the criminal behaviour as well? I don't agree that the border is suddenly a crisis. The majority of illegal immigrants arrive with legal visas and overstay their visa. These will not be affected by any sort of magic wall. The insistence on a wall along the border with Mexico and complete silence about a wall along the border with Canada strikes me as mendacious racism. The Eastern Bloc portrayed the Wall as protecting its population from fascist elements conspiring to prevent the "will of the people" in building a socialist state in East Germany. When East Germany built the Berlin Wall, they claimed that it was to protect DDR from "fascists" sneaking over the border sabotaging East Germany. In fact, it was built to keep East Germans from escaping. That so much effort has been devoted to the current "emergency", along to so many lies, tells me that the real reason for the wall is not to keep Mexicans out, but Americans in. I see no reason to assist Trump in building a Tortilla Curtain. Not the answer you're looking for? Browse other questions tagged united-states trump-wall or ask your own question. What are the primary objections Democrats have to a border wall? Has Trump or his administration published an analysis of a border wall vs. other methods of policing? Under existing US laws, could the US immigration authorities begin issuing fines to employers who hire illegal immigrants? Is there any better estimate of the cost of a completed US-Mexico border wall? Budget reconciliation for border wall?